Rescue crews are searching the smoldering remains of a fertilizer (anhydrous ammonia) facility in central Texas, and a swath of destroyed homes around it, for victims of a massive explosion that injured more than 160 people and may have killed as many as 15, authorities said. The estimate of how many may have died in the explosion Wednesday night includes an estimated three or four “first responders” who remained missing hours after the blast, most likely volunteer firefighters or ambulance workers. Officials said they were among many who responded to a fire at the West Fertilizer retail facility and were urgently trying to evacuate people from the area, after realizing that the blaze had the potential to trigger a huge blast. “Last night was truly a nightmare scenario in that community,” Texas Gov. Rick Perry (R) said Thursday, adding, “This tragedy has most likely hit every family” in West, a tiny town 20 miles north of Waco with a population of 2,800. Note: Graphic language in video, but it shows the ferocity of an anhydrous ammonia explosion. West Texas Plant Told The EPA That It Had “No Risk For Explosion”. I am so very tired of seeing the horrific results of three decades of deficit hawkery, which weakened the regulatory infrastructure of this country and results in completely preventable and massive tragedies like this. Let’s start with the lax zoning requirements, which allowed such a high-risk enterprise smack dab in the middle of a residential neighborhood. And the Chemical Safety Board, which was deployed to the West TX site last night, is chronically understaffed and inadequate because… you guessed it, it’s underfunded by a Big Oil-friendly Congress! They get $10.5 million to regulate an industry with 170 major companies making 70,000 different chemicals, totaling $750 billion revenue. Thanks, Congress! Experts say for a country the size of the United States, we should have 12,000 OSHA inspectors. We have 2,220. And the fines are laughable. So remember: This tragedy was completely preventable. We just didn’t bother. Because Grover Norquist fights to keep that money out of government agencies and in the pockets of the 1%. Freedom! The West Fertilizer Co factory of Texas, which exploded late Wednesday, was fined in 2006 by the Environmental Protection Agency for not having a risk-management plan. The same year the plant reported it posed ‘no risk’ of fire. Complaints were made in June 2006 regarding a strong smell of ammonia emanating from the plant, according to reports publicized by The Dallas Morning News (DMN). The concerns prompted Texas Commission on Environmental Quality to investigate. The plant was fined later in August by the EPA, which imposed a fine of $2,300 for failure to have a risk-management plan that was in line with federal standards. 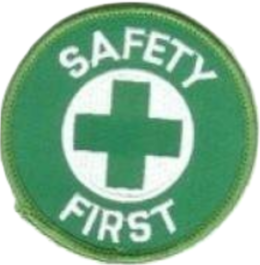 Such federal regulations are in place to ensure the prevention of chemical accidents through safeguards. Ah, yes — self reporting! The process pushed by Ronald Reagan to replace federal inspectors, who claimed companies would be honest because after all, who would want the liability costs of lying? Just about everyone, as it turns out. They went on to say that their ‘second-worst’ scenario would be a leak from a broken hose used to transfer the product, which would also not result in any injuries. The facility stated that it had no other dangerous chemicals on hand, adding that the plan was on file with the local fire department and that the company adhered to proper safety rules. Anhydrous ammonia is liable to explode if kept in certain concentrations inside containers. However, it is not generally considered a risk when in the air and in gas form. Regulators in Texas were fully aware that the fertilizer plant harbored two 12,000-gallon tanks of anhydrous ammonia and was near a school and residential neighborhood. 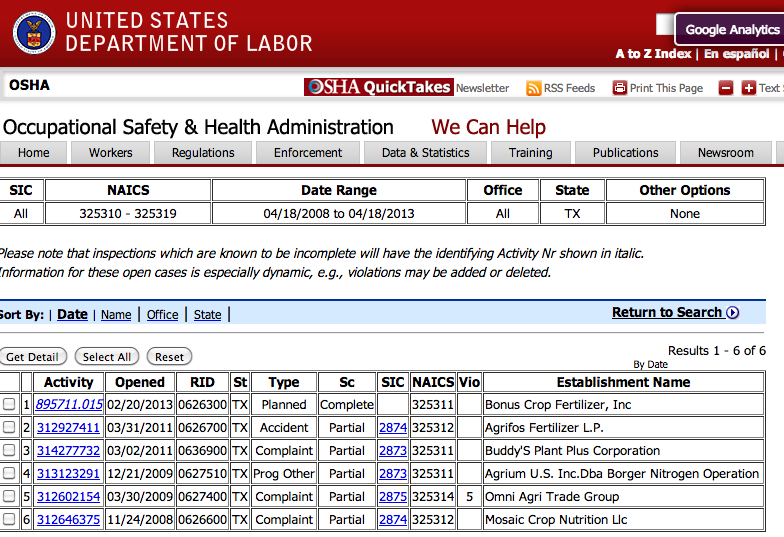 Occupational Safety and Health Administration (OSHA) online records also show that there have been no federal inspections of West Fertilizer Co. over the past five years. West Fertilizer Co. aka Adair Grain Inc. is owned/managed by Donald Adair, Tedd Uptmore and Wanda Adair, according to Lee Fang. Grain elevators are also prone to explosions. Seems like it might be a good idea to inspect all of their holdings. I wonder if it will happen. And I wonder if our lazy, complicit media will look at the larger picture. Note: The political rhetoric noted in the piece above from Crooks and Liars was used not as a reflection of this Blog’s political leanings. It was used for facts related to why “Incidents Like this Happen”in the USA..
‹ PreviousOver 400,000 Served! Thank You! Next ›Fraidy Cats: Is Fear Jeopardizing Worker Safety?